1. Press and hold button on remote for 3 seconds, then blue light start to flash. 2. Turn on Bluetooth in your cellphone and search selfie stick. 3. Connect to your phone and start to selfie. 1. Advanced anodizing treatment aluminum alloy, extendable. 2. Bucking tripod with anti-skid pads, ABS+PC made, more stable when using tripod. 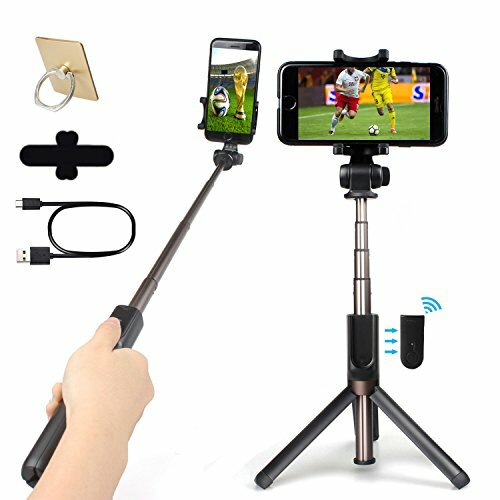 Anjustable angle for phone holder neck and 360 degree rotation for phone holder, holding phone vertically and horizontally. 1. Why is it volume adjust on phone while press remote? It's mainly becuase of setting issue, not set volume key as shortcut key for shutter. You can reset it either in camera app or in system option according to your OS. 【Integrated Tripod & Remote Detachable Plus Rechargeable】It integrates monopod and tripod together with a detachable and rechargeable Bluetooth remote shutter control. Just unfold tripod legs at bottom of selfie stick to make a TRIPOD while fold to get a monopod stick. The Bluetooth remote is attached to stick, no worry for loss, and could be taken in your hands when take picture/video. If you have any questions about this product by SUDO, contact us by completing and submitting the form below. If you are looking for a specif part number, please include it with your message.